Cedar decking is thicker than treated lumber and takes a beautiful easily maintained finish. 8' length in stock all year around in both 5" and 6" widths. Cedar costs about 25% more than pine. Loft flooring is similar to the eased corner decking, but has a groove on the underside. You can see the grooves from the bottom looking up to the loft. 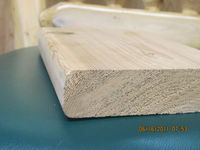 This is tongue and groove, for easy installation, and is available in many sizes and in Northern White Cedar and Pine. .. .Add to Favorites. .Send to Friend. .Contact Webmaster.